In his book, The Direction of Play, Kajiwara Takeo personifies the stones, describing the direction of play from a given stone in terms of the stone's desire to move in that direction. The direction of play from a star-point (hoshi) stone is towards the middles of the adjacent sides. Allowing the opponent to play at those points makes your star point sad. The meaning of this proverb is that, relative to other opening moves, the value of a hoshi stone is extremely contingent on how you develop it. What Kajiwara is trying to say is that if you choose hoshi in the opening, you should make the utmost strategic effort to get those critical points. According to Kajiwara, the correct direction of play would be to play the approach at immediately, without - . 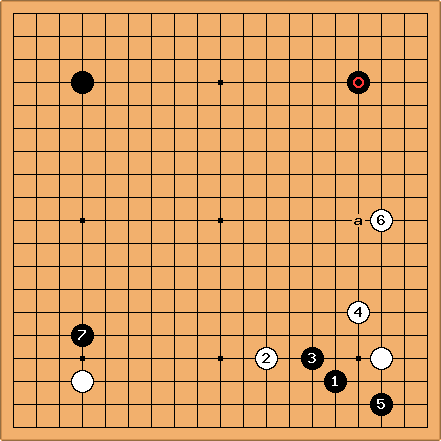 If White then enclosed the lower right by playing at , then Black could take the mutually big point at (or a) and his star point would smile.